Eight Walt Disney Studio shorts, featuring some of the company's most beloved characters, are collected on Extreme Sports Fun. 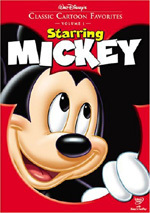 The cartoons assembled are: "Soccermania," where Goofy leads Huey, Dewey, and Louie to re-capture a valuable soccer trophy; "Canine Caddy," with Pluto playing caddy to Mickey Mouse's golfer; "How to Ride a Horse," a Goofy cartoon previously unavailable on home video; "Olympic Champ," Goofy's tribute to the international games; "Hockey Champ," in which Donald teaches his nephews the ice sport; "Aquamania," where Goofy battles an irate octopus from his boat; "Goofy Gymnastics," another Goofy short where the character demonstrates a variety of events; and finally "Tennis Racquet," where Goofy plays himself in a tennis match. With the wonderful “Walt Disney Treasures” sets meant for the serious collectors, we now get another series aimed more at casual fans of animation. Earlier we found four packages of character-specific shorts, but now we find some oriented toward themes. Entitled Extreme Sports Fun, this one presents eight cartoons in one package that deal with various games. Those die-hard fans will already own all of these shorts via a combination of sets. Five of the eight come from The Complete Goofy. “Canine Caddy” also appears on The Complete Pluto, Volume 1. 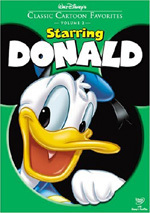 “Hockey Champ” shows up on The Chronological Donald, Volume 1, while “Mickey’s Polo Team” emanates from Mickey Mouse in Living Color. How to Play Baseball (1942, J. Kinney): A narrator tells us the ins and outs of baseball while Goofy demonstrates. The short has fun with the various quirks of the sport. I don’t care much for most of these Goofy “How to…” cartoons, but this one stands out as a better entry. 7/10. Double Dribble (1946, Jack Hannah): Two teams full of guys who look like Goofy duke it out on the court. Essentially another entry in the “How to…” series, this one differs only in that the narrator doesn’t provide instructional information; we get a play-by-play announcer and simply watch a game. That helps make “Dribble” better than usual for the genre, though not up there with Disney’s best shorts. 7/10. How to Play Football (1944, J. Kinney): This one is essentially the same as “Dribble” except the Goofys play football instead of basketball. We watch a game with play-by-ball. It’s a decent short, though perhaps not quite as good as “Dribble”. 6/10. Mickey’s Polo Team (1936, D. Hand): The “Movie Stars” (Stan Laurel, Oliver Hardy, Harpo Marx and Charlie Chaplin) face off against the “Mickey Mousers” (Mickey, Goofy, Big Bad Wolf and Donald Duck) in a polo match. Sometimes the Disney shorts with celebrity guests rely too much on caricatures to tell the story and they can be lazily plotted. That’s the case with the almost story-free “Team”, but the mingling of Disney characters with Hollywood stars makes for a cute experience. 7/10. Tennis Racquet (1949, Jack Kinney): Two Goofys play each other in a tennis match while Goofy does play-by-play in front of a crowd of Goofys. Yeah, this is another short like “Dribble”, “Baseball” and “Football”. It offers decent amusement but fails to turn into anything special. 6/10. Goofy Gymnastics (1949, Jack Kinney): Stressed by work, Goofy takes up gymnastics to get into shape, and the short shows us how this works. Yet another branch off the “How to…” tree, “Gymnastics” has its moments, but it’s the weakest of this set’s cartoons. 5/10. 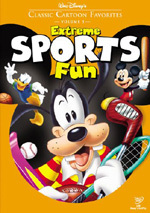 Extreme Sports Fun appears in an aspect ratio of 1.33:1 on this single-sided, single-layered DVD; due to those dimensions, the image has not been enhanced for 16X9 televisions. Sourced entirely from shorts that previous appeared in various “Walt Disney Treasures” sets, the remastered cartoons consistently looked nice. Print flaws varied but generally stayed minor for material of this vintage. Overall, the most significant issues related to light dust along with some occasional marks, speckles, grit and blotches. The problems caused few intrusions given the age of the shorts, though. Colors consistently seemed strong. The tones were bright and vivid throughout the shorts, with very few exceptions on display. The cartoons stuck largely with primary colors, and these looked quite distinct and vibrant at virtually all times. Black levels also appeared nicely deep and rich, while shadow detail was clear and accurate throughout the shorts. Overall, I was quite pleased with the quality of Sports. In addition, the monaural soundtrack of Extreme Sports Fun matched up with the better than decent audio of prior sets. Dialogue sounded a little edgy at times, but for the most part, the lines were acceptably clear and accurate. Effects showed a bit of distortion and harshness, but they stayed fairly clean and distinct through the shorts. Music also demonstrated variable levels of shrill and rough tones, but this wasn’t unexpected, and the score seemed reasonably solid. Decent depth accompanied some effects, such as stomping of large characters, but the track was pretty thin and tinny as a whole. Varying levels of background concerns appeared throughout the shorts. I heard modest hiss at times during the cartoons. However, the tracks seemed pretty clean for audio of this era. Overall, the sound heard during Extreme Sports Fun won’t win any awards, but I found the mixes to come across as pretty clear and accurate for their age. No significant extras appear on Extreme Sports Fun. We get a collection of ads in the Sneak Peeks domain. This includes promos for Tarzan II, Cinderella, Lilo & Stitch 2, Kronk’s New Groove, Disney Learning Adventures, Pocahontas and the Disney Princess line of products. Aimed at casual fans, Extreme Sports Fun may prove satisfying for folks with a hankering for just a taste of Disney. More dedicated animation buffs will probably already own all eight shorts, as they already appeared on various “Walt Disney Treasures” releases. However, this set includes a nice sampling of good cartoons. None of them excel, but none of them fall flat, either. Pick this up if you don’t have the shorts via those “Treasures” sets.